TOLEDO, O.H. -- Toledo scored two runs in the 10th inning without recording an out to beat Rochester 4-3 Sunday night at Fifth Third Field. Jacob Robson delivered the walk-off single off John Curtiss (2-4) after Daz Cameron tied the game with a single one batter earlier. Juan Graterol had given the Red Wings (56-68) a lead in the top half with an RBI base hit off former Wing Caleb Thielbar (4-1). 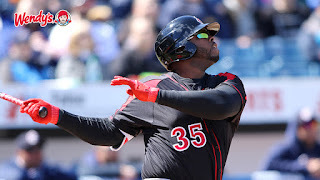 Kennys Vargas opened the scoring with a solo home run in the 4th inning off Jacob Turner. It was the second homer in as many games for Vargas, who broke a tie with Trevor Plouffe to move into sole possession of second place during the Twins era (since 2003) with his 49th career long ball with Rochester. Ryan Eades made a spot start for the Red Wings after it was announced Stephen Gonsalves will make his major league debut for the Twins on Monday. Eades fired 4.0 scoreless innings while surrendering two hits and a walk while striking out five. The Mud Hens (63-62) scored twice in the 6th to take a 2-1 lead. Vargas would drive in Byron Buxton with a two-out, two-strike single in the 9th to tie the game at two apiece. Vargas and Willians Astudillo both finished 2-for-4, combining for four of Rochester's six hits. The Red Wings return home Tuesday to begin a four-game, three-day homestand with Pawtucket.